It’s supposed to be spring already, but today was a drizzly day after a long and snowy winter… soup was in order. 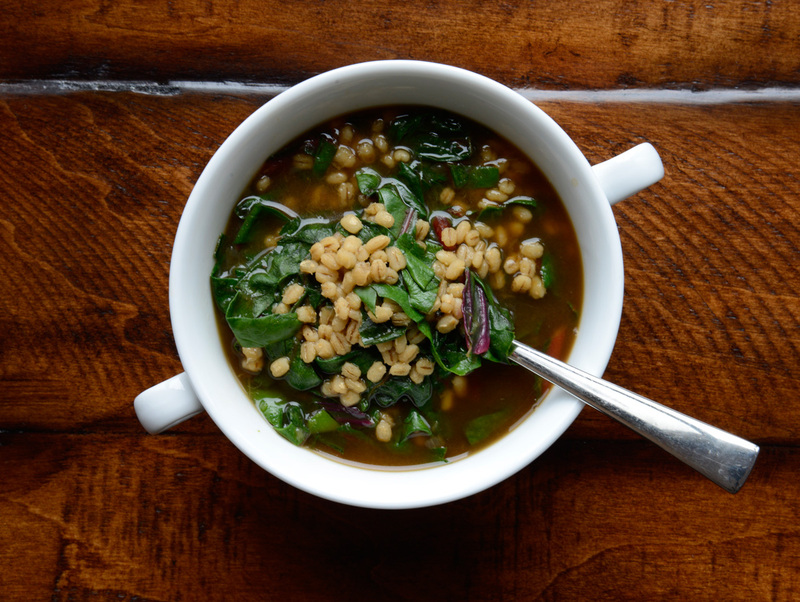 I craved the silky texture of flash-cooked Swiss chard and the toothsome texture of barley, so here is the soup I came up with. If you have escarole or spinach in the refrigerator, they work well in place of the chard. 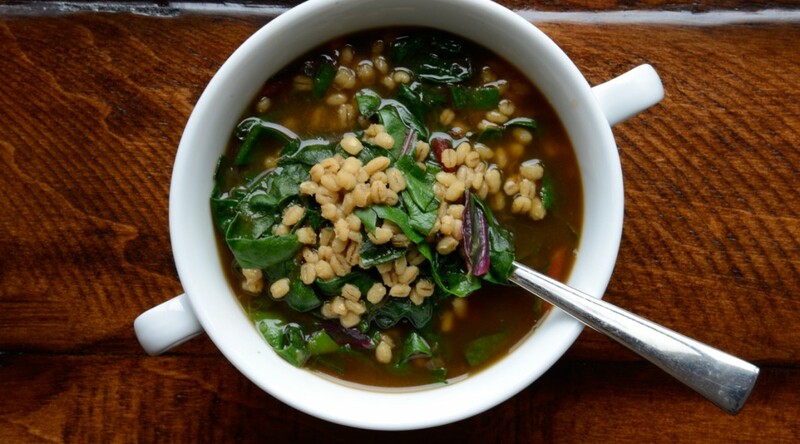 Variation: To make this soup creamy in texture and a bit spicy, whisk together 2/3 cup plain low-fat Greek yogurt, 1 grated garlic clove, 1/4 teaspoon salt, 1/4 teaspoon Aleppo pepper, and 1 teaspoon crumbled dried mint, then stir into the soup just before serving. Place 1 teaspoon of the olive oil in a saucepan and add the onion and garlic. Cover with a tight-fitting lid and cook over medium-low heat until the onion is soft and barely golden, about 8 minutes, stirring once in a while to prevent the garlic from burning. Add the broth, and bring to a gentle boil. Drop in the barley and season with the salt and pepper. Cook, covered, stirring once in a while, until the barley is fully cooked but not mushy, about 30 minutes. When you are ready to serve, stir in the chard leaves, and cook until they are soft and wilted, about 3 minutes. Taste for salt and pepper and adjust as needed. Serve hot, drizzled with the remaining tablespoon of olive oil. For extra richness, sprinkle with freshly grated Parmigiano-Reggiano.